I generally read the whole stack of 13-or-so comics every Wednesday night, forming first impressions and getting a sense for the week as a whole. Then, as I write my reviews of individual issues, I go back and read the issue in question very closely. I’m finding that a lot of comics that I thought were garbage that first night turn out to be at least a little bit better when I sit down and judge them more deliberately. 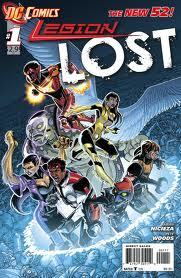 Legion Lost #1 is one of those comics that improved its standings on the second read. But even with that said, there are enough problems with the presentation that I can’t exactly sing its praises, and I think my affinity for some of the characters is starting to get in the way of my better judgment. I have a strange relationship with the Legion of Superheroes. When I was a kid in the 1980s, I purchased a huge collection of back issues from the last 10 years or so. While I kind of liked the Baxter-paper premium Legion of Superheroes series that sometimes crossed over with the Baxter-paper New Teen Titans (probably my second favorite DC comic at the time, after the All-Star Squadron), the Legion in these older books seemed more about silliness than adventure. There was the Legion of Super-Pets and the Legion of Supstitute Heroes. There were a bunch of characters named ________ Lad. It all came across, from a distance and judged mostly by covers and Who’s Who entries, as a bit of a joke. I dismissed the Legion as not worth my time, and I could never really understand how so many fans had such affinity for the characters. Then, decades later (after two reboots and a bunch of other stuff that further convinced me I’d made the right choice), my friend Michele Carter lent me the first seven volumes of the Legion of Superheroes hardcover archive editions, which contained the earliest adventures of the Legion from their birth in Superboy in the 1950s through the classic run written by 14-year-old Jim Shooter. Turns out I’d been absolutely right about the silliness factor. But a funny thing happened as I read all of those old stories. I actually started to like a lot of the characters, and I began to really appreciate the possibilities with a giant team of young heroes. Most of all, it was fun. And I almost can’t believe I’m typing this, but when they handed over the series to a 14-year-old kid, it actually got much, much better. Shooter’s youthful imagination brought the Legion to new heights of adventure, and I began to see what others liked about the team. I never translated this newfound understanding into actually purchasing modern Legion of Superheroes comics, mind you, but at least I no longer looked at them with disdain. When I heard about DC’s New 52 reboot, I was very interested to see what they planned to do with the Legion of Superheroes. With a cast of scores of characters from several different “takes” on the Legion throughout the years and a setting in the 31st century of the DCU, I figured there would be continuity issues that could use clearing up, and that the whole franchise would benefit from a fresh start. That such a fresh start would likely focus on the “original” Legionnaires like Cosmic Boy, Saturn Girl, and Lightning Lad—the characters I identified with and liked—made the prospect all the better. But that’s not really what’s happened. For starters, I’m coming to realize that the New 52 “reboot” is really a reboot only if Geoff Johns and Jim Lee think a character has become too confusing or lame. Green Arrow? You’re starting over with a totally new take. Supergirl and Superboy? You poor bastards are starting over from scratch. Green Lantern, Legion of Superheroes? You guys are cool. Carry on just like before, please. So for starters, the fact that the Legion is in that “protected class” with Batman and Green Lantern is frustrating, and makes the new issues more difficult to get into than they should have been. That said, the Legion is the DC property most frequently ruined by continuity overhauls and reboots, so I’m sure there’s a legion of fans out there thanking the heavens that they don’t have to go through that ordeal again. Legion fans are loyal (they almost have to be, given the indignities suffered by the team over the years), so perhaps “rewarding” this loyalty by not forcing yet another reboot upon them was the best business strategy. But for new readers… again, unless they’re very careful, I think it could be a disaster. Writer Fabian Nicieza is an old pro at the comics game, so when it comes to character details like powers and real names, he does a good job setting up his new team. That team includes only one legitimately “classic” Legion character, Timber Wolf (a great choice), as well as a few top-shelf second stringers like Wildfire, Dawnstar, and Tyroc. And then there are a bunch of losers I’d never read about before. Shapechanging Durlan Yera (who I think used to be called Chameleon Girl—she’s a female version of Chameleon Boy, anyway), a teleporting bug named Gates, and a mute psychic telekinetic giant called Tellus. Most of these character have gotten an update to their classic costumes (which in some cases were a bit an an embarrassment). I liked Tyroc’s new duds, and Dawnstar’s costume seems like a more functional look than her original “Village People Indian” style (though it still has a neckline that plunges to her navel to show off breasts almost as big as her head). Wildfire’s lost the distinctive orange suit that contains his energy form, and instead now wears a red and black suit of armor with a clear star-shaped chestplate that shows off the plasma within. I think it looks pretty cool. The story opens with a villain I’ve never heard of called Alastor freaking out about how he “shouldn’t be here”. The guy looks like a human with glowing tattoos on his face, but he calls the doctors at a rural Minnesota health center “filthy human scum” before apparently exploding into a huge sphere of green energy that I suppose kills just about everyone. Cut to the Legion team looking for him as their time bubble spaceship crashes through the “Flashpoint Breakwall” (more continuity from the mega-event that immediately preceded the New 52, another frown from Erik) and plummets to the ground. Neither their ship nor their trusty Legion flight rings work, and the pollutants of 21st century Earth are too much for Dawnstar to process. Yera, too, seems to be having problems with the environment that make her sick. The Legionnaires are worried about their broken ship, but a few of them are even more worried that they need to find Alastor “before the pathogen is released”. All this stuff about Alastor and a pathogen and the Flashpoint Breakwall makes me feel like I’m coming into the story in the second or third issue. Nicieza may just be going for an in media res sort of “throw them right into the action” approach, but it feels like too much of the plot is missing, and my assumption as a reader is that I’m just supposed to know about this stuff. Which is madness, because this is supposed to be the first issue. Anyway, Timber Wolf gets Alastor’s scent, and goes running off without the team. “He used to be called Lone Wolf, you know,” says Wildfire, hearkening back to the character’s 1960s origin story. A nice touch. The team finds the remnants of Alastor’s ship and salvage it for parts to repair their own. Meanwhile, in the pleasant little town nearby called Red River Falls, Alastor has turned into a kind of demonlike monster thing, and is trashing up the place. He throws a car and presumably kills two police officers, making cops officially the most endangered species in the New 52 relaunch. He keeps trashing the place until he runs into a little girl holding a teddy bear, who’s crying about how she can’t find her sister. This gives the alien pause, and he finally collapses on the ground, unconscious and reverted to his human-looking form. In another nice touch we see that Timber Wolf has arrived from his reflection in a puddle on the ground. Back at the crash site, Dawnstar has finally gotten control of herself. She flies into the air and uses her powers to connect to the environment (I think), which reveals that the Legion is too late. Alastor has released the pathogen, and the human race is doomed. Timber Wolf arrives with a trussed-up Alastor, and they all board the repaired time bubble to return home to the 31st century. Alastor wakes up and shouts out a villainous screed. I don’t really have any idea what any of that means, but it explains the earlier scene with the crying little girl and it adds a touch of humanity to the villain. And that’s basically where the issue ends. The Legion is stranded somewhere in time and space without a ship, without functioning time rings, and very possibly this future will be tainted by Alastor’s release of the pathogen in the past (our present). It’s a good premise, and could lead to some interesting “alternate reality” storylines. The fact that the team is made up mostly of losers means that there could be very high stakes involved. But even though I found this issue a better read the second time, it’s still pretty thin. Aside from “get shipwrecked,” the team doesn’t really do anything. Timber Wolf is by far the most active hero in the book, and all he does is run from the crash site to the town, to discover the villain already passed out on the street. There are some nice character moments, but remarkably little happens in the issue, and we don’t ever get to see the team itself in action of any kind. For the most part, Tyroc, Tellus, Yera, Gates, Wildfire, and Dawnstar just stand around a broken spaceship and talk to each other. Nicieza does a nice job with the small character bits, and his dialogue is good enough. Woods’s pencils and costume redesigns are pretty cool. This is definitely a professionally produced comic. What it doesn’t feel like is anything particularly new, and it doesn’t feel like a great jumping on point for readers unfamiliar with the Legion of Superheroes. This book has some definite potential, but the next couple issues need to include more action and more of a sense of what the heck is going on for me to remain interested. SO sad, as Roger Stern did great stuff with the Legion a few reboots ago. Gates was from that version.